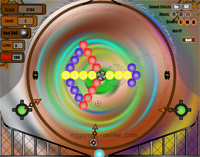 Aim of the game is to clear the screen in each level and get as many points as possible. There is a 120 second time limit in each level. Get 3 balls or more of the same colour together to remove them from the screen and to get points. There are 8 colours as well as 3 bonus balls types. Controls: Move the mouse to position the shooter. Hold down the mouse to aim. Let go of the mouse to shoot.